The “cost-of-living” allowance or COLA is officially called “post allowance” in the State Department. It is an allowance based on a percentage of “spendable income,” i.e. money you can really put your hands on to spend on goods and services. The allowance is calculated by comparing costs for goods and services in multiple categories – including food (consumed at home or in restaurants), tobacco/alcohol, clothing, personal care items, furnishings, household goods, medical services, recreation, public transportation, or vehicle-related expenses – to the cost of those same goods and services in Washington, D.C. The State Department’s Office of Allowances determines a ratio between the average cost of goods and services at the foreign post to costs in Washington, D.C. It then evaluate expenditure patterns between the foreign location and Washington, D.C. to establish an overall cost index, which may be adjusted biweekly for exchange rate fluctuations. If the overall cost of goods and services at a foreign post, taking into account expenditure patterns, is at least 3% above the cost of the same goods and services in the Washington, D.C. area, the office establish a post allowance. See DSSR section 220 for more information. According to state.gov, this allowance is a balancing factor designed to permit employees to spend the same portion of their basic compensation for current living as they would in Washington, D.C., without incurring a reduction in their standard of living because of higher costs of goods and services at the post. The amount varies depending on salary level and family size. 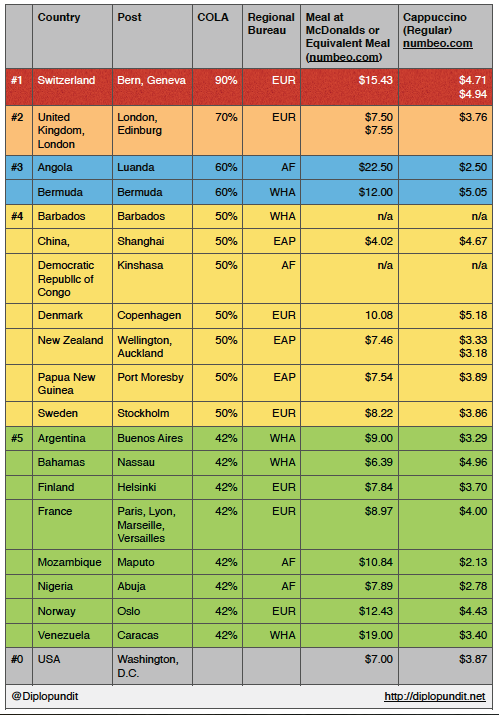 We put together a list of countries and posts with the highest State Department COLA rate as of January 2015. Posts in Europe (EUR), Africa (AF), East Asia Pacific (EAP) and the Western Hemisphere (WHA) are represented. No posts from South Central Asia (SCA) and Near East Asia (NEA) made it to this top list. The traditionally expected expensive posts like Tokyo, Vienna, Hong Kong, Sydney and Rome are all in the 35% COLA rate and are not included in this list (we chopped the list at 42%; representative posts in France at the 42% rate are included). Note that we added a couple of columns for the cost of a McDonald’s meal (or equivalent) and cost of a regular cappuccino from numbeo.com, a crowdsourcing site for cost of goods and services around the world. For another snapshot on most expensive cities for expat employees, click here with data from the Economist Intelligence Unit’s Worldwide Cost of Living ranking (costs compared to NYC) and Mercer’s Cost of Living surveys from 2014. Corrected the spelling for Ediburgh. Also the Allowances Bi-Weekly Updates dated February 8, 2015 indicate several changes on the COLA table, so we updated it to reflect that newest data. Switzerland went from 90% to 100% in this latest update. Shanghai, Copenhagen, Auckland and Wellington went from 50% to 42% COLA posts. Helsinki, Paris, Lyon, Marseille, Versailles and Oslo were all downgraded from 42% to 35%, so we took them off this table. It is conceivable that the rankings in allowances will change again in a couple of weeks or in a few months. The bi-weekly updates are located here. The original list we did based on end of January data is located here. 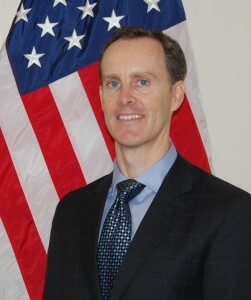 Douglas M. Griffiths is a career member of the Senior Foreign Service and currently serves as the U.S.
Deputy Permanent Representative to the United Nations in Geneva, Switzerland. From 2006 to 2009, he was the Principal Officer at the U.S. Consulate General in Guayaquil, Ecuador. Previous overseas assignments include: Deputy Chief of Mission and Chargé d’affaires, ad interim at the United States Embassy to the Republic of Haiti (2004-2006); Counselor for International Economic Affairs at the U.S. Mission in Geneva, Switzerland (2000-2004); and First Secretary of Economic Affairs in Rabat, Morocco (1996-1999). In Washington, he worked on the South Africa desk during the South African transition to democracy. He began his career in the Foreign Service in 1988 with overseas assignments in Quebec City, Canada; Lisbon, Portugal; and Maputo, Mozambique. Mr. Griffiths received a B.A. from the University of Notre Dame and an M.P.P. from Princeton University’s Woodrow Wilson School. Mr Griffiths’ UN bio indicates that he speaks French, Portuguese and Spanish. He is married and has two children. If confirmed, he would succeed career diplomat, Leslie V. Rowe who was appointed Ambassador to Mozambique in 2009. No political appointee has ever succeeded in getting appointed to the US Embassy in Maputo since it was opened in November 8, 1975 after its independence from Portugal.